From Genesis to Revelation, the themes of priesthood and kingship overlap and intertwine in the history of redemption. 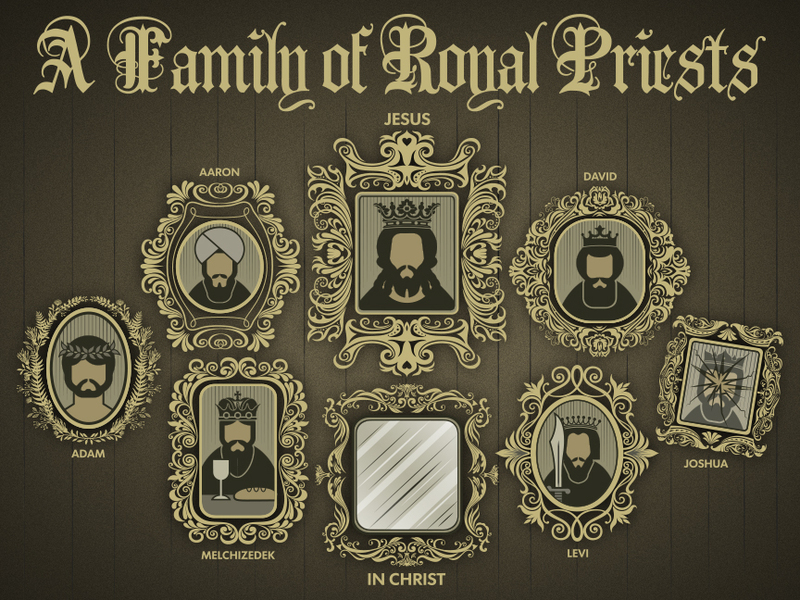 In this new sermon series we are examining how royal priesthood applies to Jesus, the church, and our identity in Christ. In this first sermon, we consider how Adam and Eve were created in God’s image to be royal priests serving and worshiping in the Garden of Eden. You can read about the background to this sermon series here and listen to the sermon online here. Response questions and Additional Resources can be found below. What comes to mind when you hear the word “priest,” “priesthood,” “royal priesthood”? As you have read about priests and Levites in the Bible, what have you thought? How does it apply today? How have you understood Genesis 1–2? How do these chapters inform your worldview? Self-perception? Hope and need for salvation? How would the original audience understand the meaning of “image of God?” How does being an image-bearer impact your daily life? Read Psalm 115. How does your worship impact your living? What are you worshiping? What do you do to grow in your worship of God? Read Romans 5:12–21. What do we learn about Adam and Jesus? What does Genesis 1–2 teach us about Adam? How does that enhance your understanding of or devotion to Christ? What other questions come to mind from Genesis 1–2? What are ways that priesthood applies to your life today? Prophet, Priest, and King: The Roles of Christ in the Bible and Our Roles Today by Richard P. Belcher, Jr.
“Priests and Priesthood” The Southern Baptist Theological Journal 22.2 (Summer 2018) — In particular, G. K. Beale’s article “Adam as the First Priest in Eden as the Garden Temple” contains a list of reasons for seeing Adam as the first priest in the Bible. For those questioning this interpretation of Genesis 1–2, this is a helpful article. Finally, here is a compelling video/song that captures the truth of Romans 5:12–21, which gives important commentary on Genesis 1–3.